By 1830 Tocal had 2,800 sheep split into small flocks and tended by nine or ten convict shepherds. Their job was to keep the flock together and protect the sheep from attack by native dogs (dingoes) which were plentiful. Two shepherds usually watched each flock during the day and the flock was yarded at night where one shepherd kept guard. The yards often consisted of portable hurdles, and hurdle making became a common occupation for convicts. 'the shepherd tends the sheep by day, and the hut-keeper ... by night. Where there are good paling yards or strong hurdles, the hut-keepers generally venture to sleep... 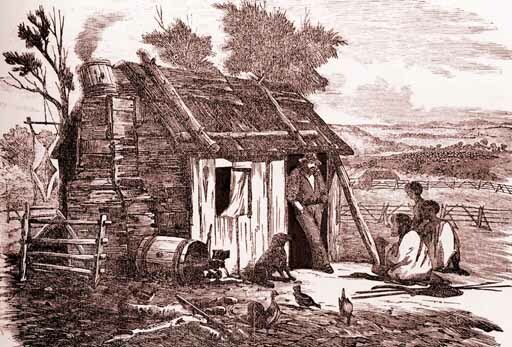 The hut-keeper at this station was obliged to watch all night, for his yard would in many places have suffered the [native] dog to crawl through; and if one gets in, he bites and worries sometimes thirty or forty sheep before he is discovered. When the shepherd turned out his flock in the morning, the hut-keeper having first cleared the floor of the hut, he drove them in a mass up to it, and they soon crowded in and filled it. On my asking them why they did this, they told me that by doing so the fleas all got into the sheep and were carried away into the bush, and that they often cleared the hut thus.' [from A Harris, Settlers and Convicts, 1847]. Below: a shepherd's hut. Note the sheep hurdles in the foreground (left) and background. [Illustration by S.T. Gill].